Do you want to listen to the best electronic music no matter where you are? We thought so ;-) You can now listen to clubberry.fm not only from your PC, but also while at work, during class, while traveling, or just simply relaxing at home; not to mention from any country and on any continent. * We also provide 256kbps streaming, giving you not only the freedom to stream from anywhere but also in higher quality than traditional FM radio stations. 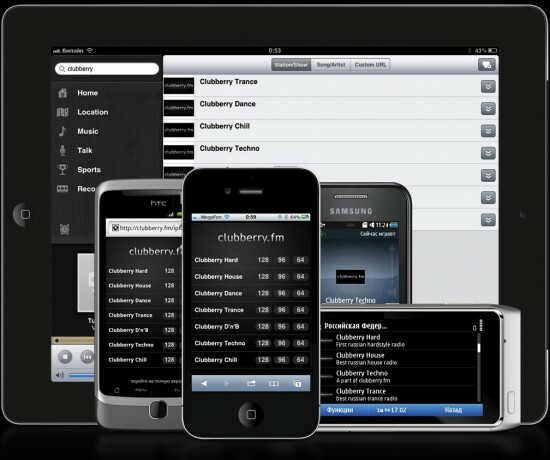 To listen to clubberry.fm on the go, you need these two simple things: any modern smartphone and 3G Internet. Anyone can afford a smartphone nowadays, and 3G is now available nearly everywhere. Download the free app, Nokia Internet Radio, from the Nokia website — it has all of our channels already built-in. We highly recommend TuneIn Radio app. It has all of our channels in all available bitrates, including AAC+. As you can see, it's very easy and takes barely any time at all. Tell all of your friends — let's start busting the myth that you can only listen to Internet radio when you're at your computer.